To view these newsletters you need to download and install either Adobe Acrobat, or Foxit Reader (recommended) - both applications are free. Merry Christmas from us all at Maari Ma Health! 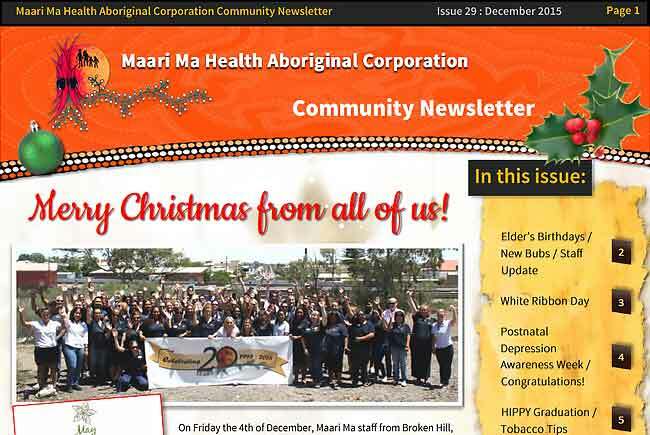 Our December newsletter has all the latest on Essential Water's water restrictions, details of our closure over the holidays, Christmas Updates, Mums and Bubs, Surviving school holidays tips, YMCA Programs, Active Kids, Clontarf presentation NIght, After School Cooking Group, Menindee Cooking Group, Christmas Recipes, Staff Update, Specialists Visit, World COPD Day, Aboriginal Funeral Transport Program, Broken Hill City Council Active Transport Plan, White Ribbon News, Dietitians Outreach Trip, 10 Tips to stay cool when it’s hot and more! 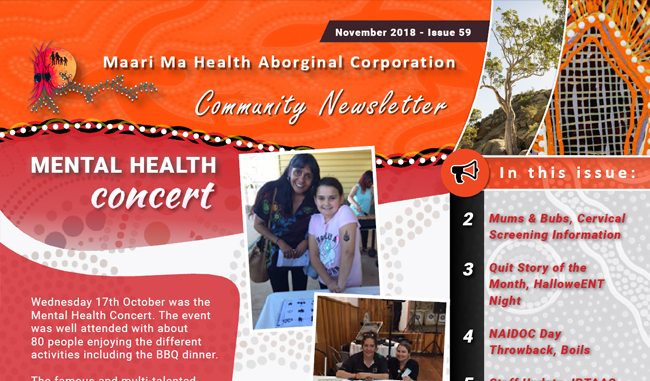 For November our newsletter features the Mental Health Concert, Mums & Bubs, Cervical Screening Information, Quit Story of the Month, HalloweENT Night, NAIDOC Day Throwback, Information on Boils, Staff Update, IPTAAS, Menindee Cooking Group, National Nutrition Week, After School Cooking Group, National Children’s Day, Community Events & Information, Women’s Survey, Webster Packs and more! 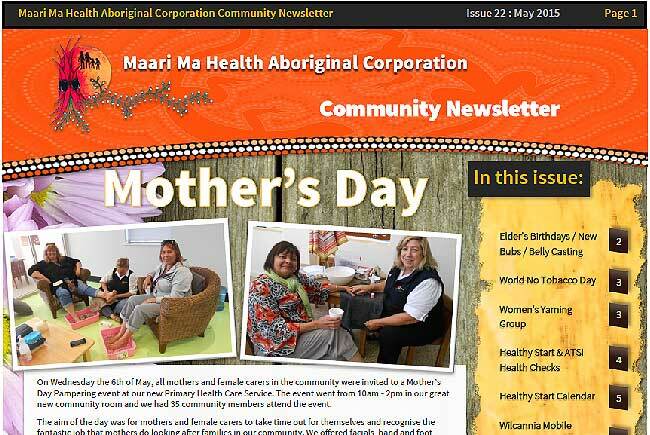 This month's bumper edition of our Community Newsletter has all the latest on Women's Health Week, Mums & Bubs, Yarning Circle, Children’s Day, This month’s Quit Story, Staff Update, What’s the BUZZ?, Women’s Healing Program, Maari Ma goes RAINBOW, Show Pass Winners, After School Cooking, Active Kids, Menindee Cooking Group, Dietitian’s Visit, School NAIDOC Day, Clontarf Year 7 Visit, Christine Anu, Info for Youth, Managing Your Money, Ivanhoe BBQ, Community Events, Health Survey, IPTAAS, My Health Record and more! 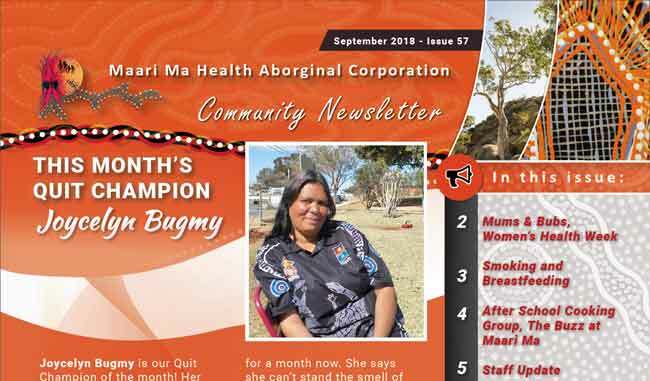 Our September Community Newsletter features this month's Quit Champion, Mums & Bubs, Women’s Health Week, Smoking and Breastfeeding, After School Cooking Group, The Buzz at Maari Ma, Staff Update, Active Kids, CSRP Camp, Community Events, Family History Month, September Events, Aboriginal Mental First Aid Course, My Health Record and more! 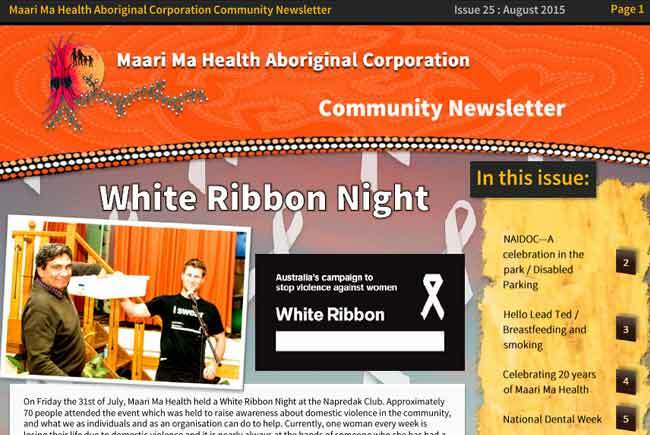 For the month of August our Community Newsletter has all the latest on White Ribbon Night at the Silver City Cinema, Mums & Bubs, Smoking and Pregnancy, Tackling Indigenous Smoking, Prescribing Drugs of Dependence, Active Kids, After School Cooking Group, Community Events, Legal Aid Civil Law Clinics, Dietitian’s Visit to Menindee, Daffodil Day, Staff Update, Family Recipe: Shepherd’s Pie, My Health Record and more! 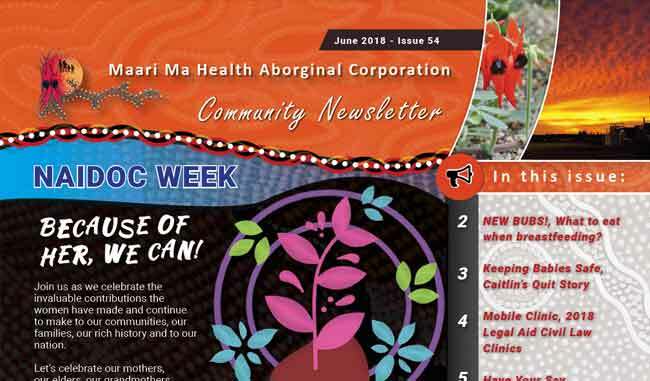 For July our Community Newsletter features NAIDOC Week: Because of her, we can!, HR Awards Finalist, NEW BUBS!, Important nutrients for pregnant women, July Events, Family Movie Night, NDIS, 2018 Legal Aid Civil Law Clinics, Why do I need an ATSI Health Check?, July Quit Story, Staff Update, Mobile Clinic, I Quit Because, Colouring-in competition winners, New waiting room chairs, Circle of Security Parenting Series, Basic Biscuits Recipe, My Health Record and more! 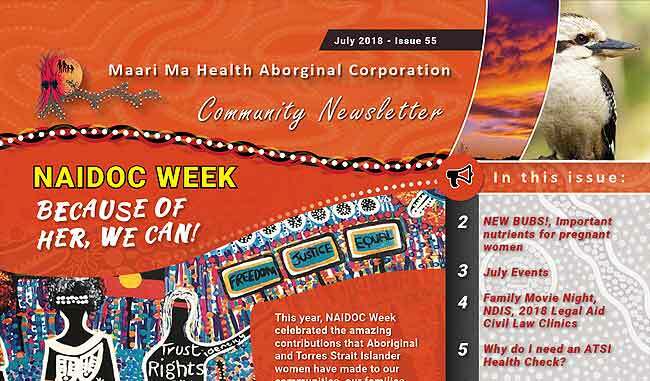 Our June newsletter has all the latest on NAIDOC Week, World No Tobacco Day 2018, NEW BUBS!, What to eat when breastfeeding? Keeping Babies Safe, Caitlin’s Quit Story, Mobile Clinic, 2018 Legal Aid Civil Law Clinics, Have Your Say, Staff Updates, White Ribbon,Endocrinology Team Visit, Active Kids, After School Cooking Group, Why is Hand Washing So Important?, and more! 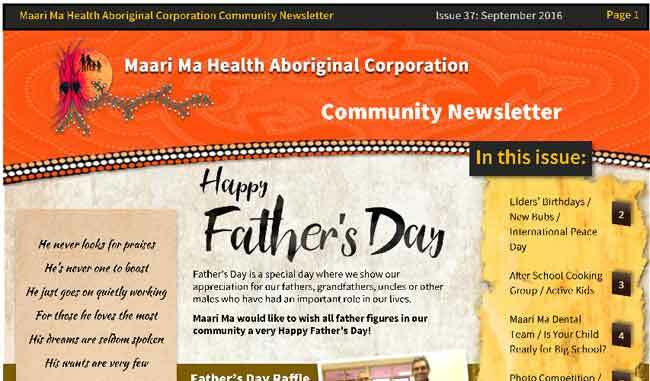 After a short break the Maari Ma Health Community Newsletter is back with all the latest stories on Mother's Day 2018, our lucky Mother's Day Raffle Winners, NEW BUBS!, Breastfeeding: What Mums Can Do, Tackling Indigenous Smoking, Art Class, Cally’s Quit Story, Flu Vaccination 2018, Staff Updates, After School Cooking Group, Pop up Free Flu Vax Day, Youth Health Team, our New Casual Transport Officer, Mobile Clinic, Regional Office Relocation, the Coming Together Community Event and more! 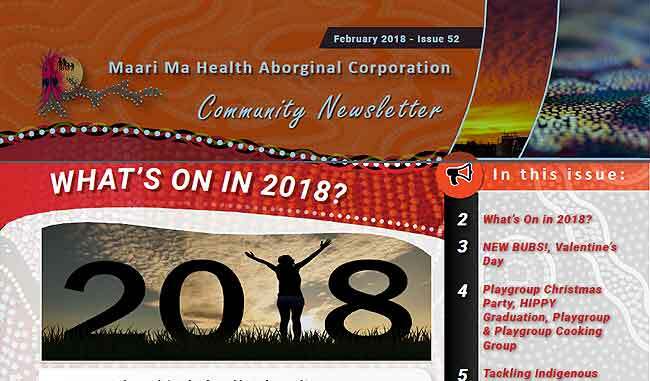 Our new newsletter for 2018 includes stories on What’s On in 2018, NEW BUBS!, Valentine’s Day, Playgroup Christmas Party, HIPPY Graduation, Playgroup & Playgroup Cooking Group, Tackling Indigenous Smoking: Art Classes, Yarning Group, Smoke Free Homes & Cars, Alinta’s Quit Story, School Terms & Contacts, Active Kids Rebate, Staff Update, Legal Aid Clinics, World Cancer Day and more! 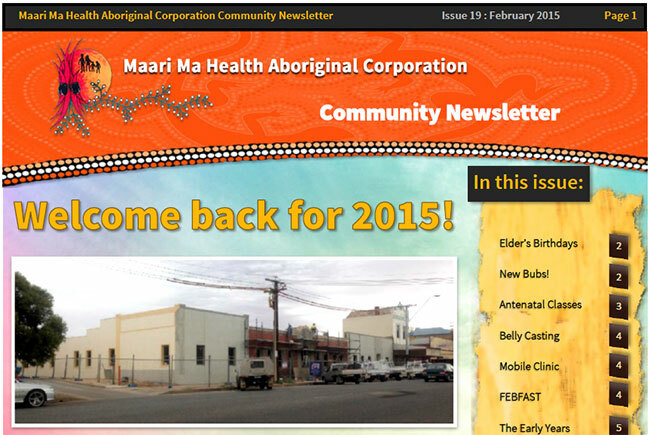 We have a new look for our newsletter this month! 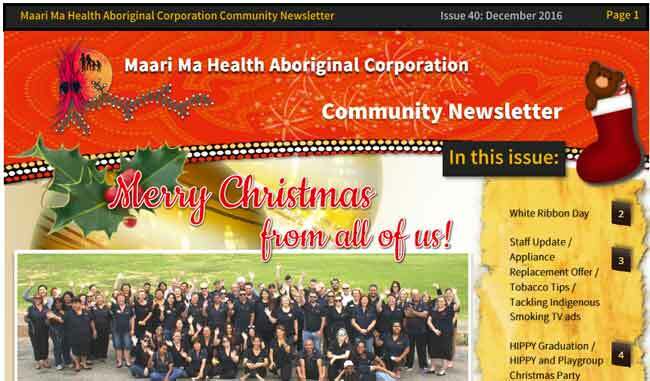 Wishing you a Merry Christmas and a Happy New Year with all the latest on our staff meeting, Christmas closure dates, World COPD Day, WHITE RIBBON DAY, Tobacco Tips for the holiday season, 6 Week Walking Challenge, Playgroup Christmas Party, Congratulations Natika!, 2018 NAIDOC Theme Announced, Attention All Children! 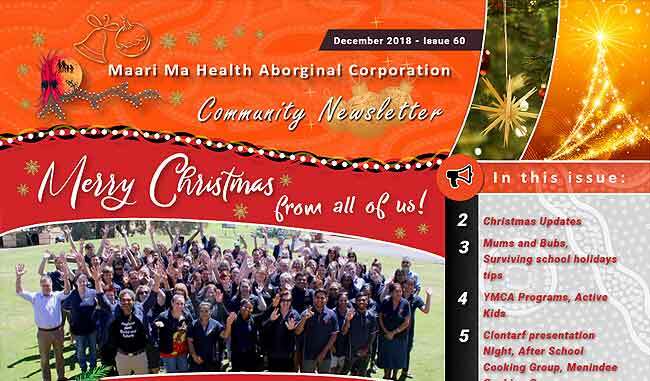 Luke & Sharon’s Quit Story, PAINTING at the Broken Hill Regional Art Gallery, Healthy Christmas Snowman Recipe, Cooking with the kids at Bugdlie / Alma Preschool and more! 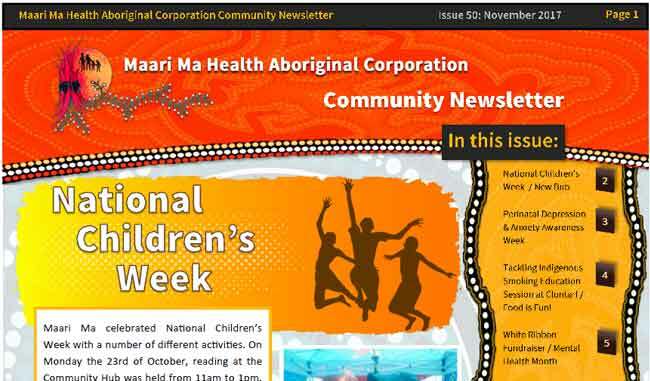 Issue 50 of our Community Newsletter has all the latest on National Children’s Week, a New Bub, Perinatal Depression & Anxiety Awareness Week, Tackling Indigenous Smoking Education Session at Clontarf, Food is Fun!, our White Ribbon Fundraiser, Mental Health Month, Important Closing Date Notice, Wilcannia Community Christmas Dinner, Heart Health, Bronwyn’s Quit Story, Printing at the Broken Hill Regional Art Gallery, Short Black Opera, a Congratulations! to Maari Ma's Youth Health Team and more! 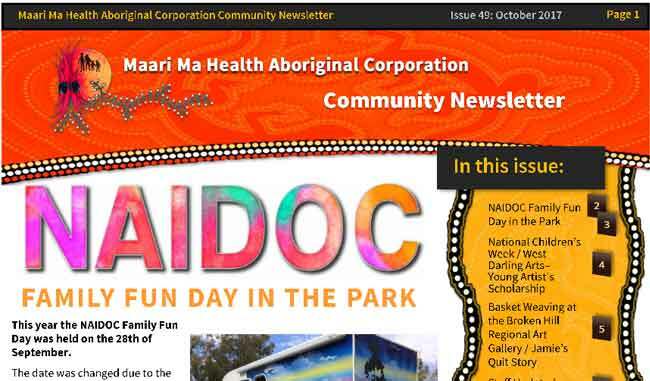 The October issue of our community newsletter features NAIDOC Family Fun Day in the Park, National Children’s Week, West Darling Arts – Young Artist’s Scholarship, Basket Weaving at the Broken Hill Regional Art Gallery, Jamie’s Quit Story, Staff Update, Mixed League Tag, Pinktober, National Nutrition Week, White Ribbon, September’s Raffle Winner, 10,000 Steps 6 Week Challenge and more! 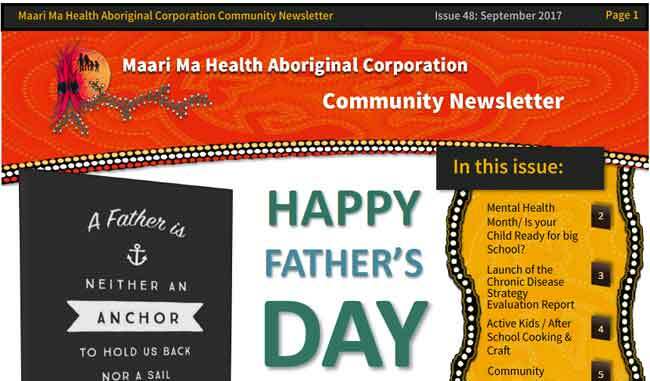 For September our Community Newsletter has all the latest on Father's Day, Bulldog Turns 70!, Mental Health Month, Is your Child Ready for big School?, Launch of the Chronic Disease Strategy Evaluation Report, Active Kids, After School Cooking & Craft, Community Survey, Children’s Week, R U OK Day, Staff Update, International Day of the World’s Indigenous People, Respiratory Clinic, Lee-Ann’s Quit Story and more! 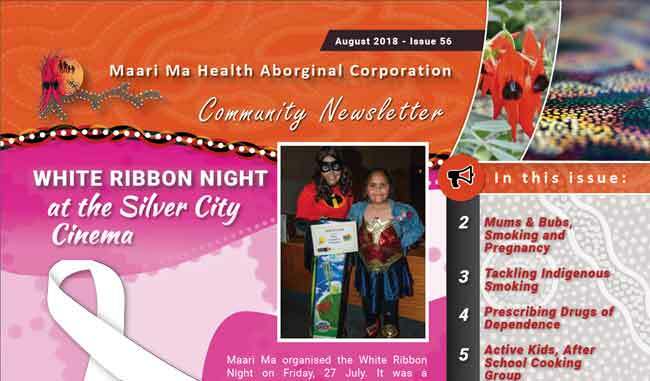 Our August newsletter features White Ribbon Night, New Bubs, World Breastfeeding Week, NAIDOC Celebrations at Railway Town Public School, National ATSI Children’s Day, Healthy Bones Action Week, Ricotta Toast Recipe, Hepatitis Awareness Week, 2017 National Dental Week, Legal Information Sessions, Community Survey, Smokers Program, Smoking & Breastfeeding,Tarissa’s Quit Journey and more! 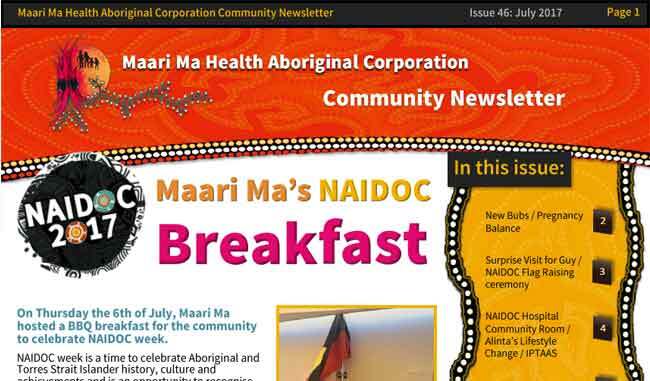 For July 2017 our newsletter features articles on Maari Ma's NAIDOC Breakfast, New Bubs, Pregnancy Balance, Surprise Visit for Guy, NAIDOC 2017 Flag Raising ceremony, NAIDOC Hospital Community Room, Alinta’s Lifestyle Change, IPTAAS, White Ribbon Movie Night, Lead Program, Community Survey, Staff Update, NAIDOC Yarning Group - and more! 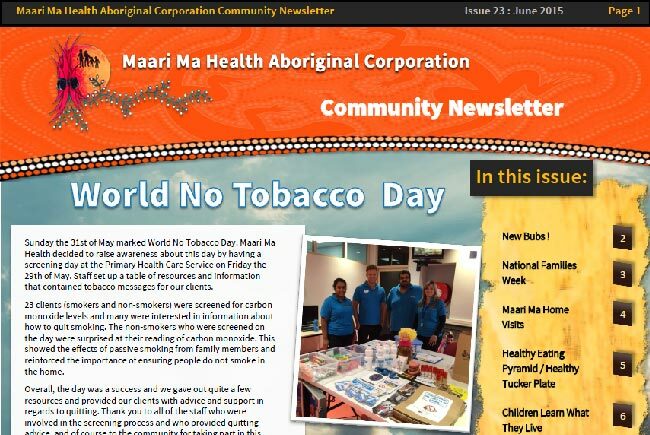 Our June 2017 community newsletter features stories on World No Tobacco Day, Red Nose Day, New Bubs!, Smoking and Pregnancy, School Services Expos, Australia’s Biggest Morning Tea, Supporting Suicide Prevention, Mother’s Day Raffle, Mental Health Education Session, White Ribbon Colouring Competition, IPTAAS, Community Survey, Smoke Free Homes & Cars, Have you had your flu vax? - and more! 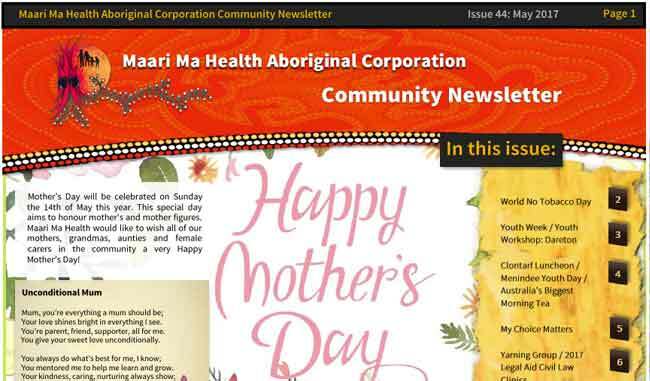 For the month of May our community newsletter features news on Mother's Day, the Mother’s Day Raffle & Morning Tea, Little J & Big Cuz, World No Tobacco Day, Youth Week, Youth Workshop: Dareton, Clontarf Luncheon, Menindee Youth Day, Australia’s Biggest Morning Tea, My Choice Matters, Yarning Group, 2017 Legal Aid Civil Law Clinics, Maari Ma Youth Health Clinic, Maari Ma Staff Update, Community Survey, Maari Ma’s Lead Program and more! 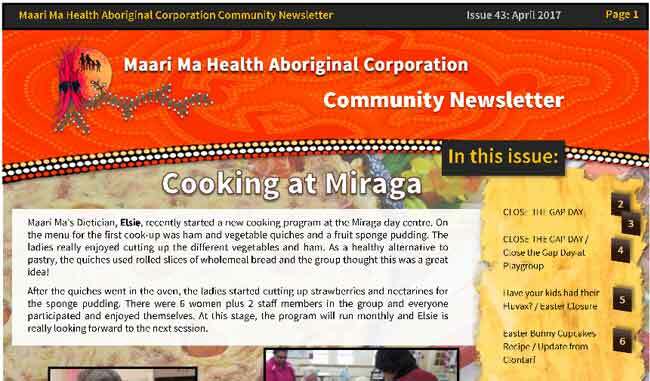 Our April Community Newsletter has all the latest news on Cooking at Miraga, Anzac Day, the Aboriginal War Veteran: Reg Saunders, Close The Gap Day, Close the Gap Day at Playgroup, Have your kids had their Fluvax?, Easter Closure Dates, a delicious Easter Bunny Cupcakes Recipe, Update from Clontarf, Promoting Healthy Choices at Broken Hill High School, Active Kids, Maari Ma Staff Update, Yarning Group, Home Medicines Review and more! 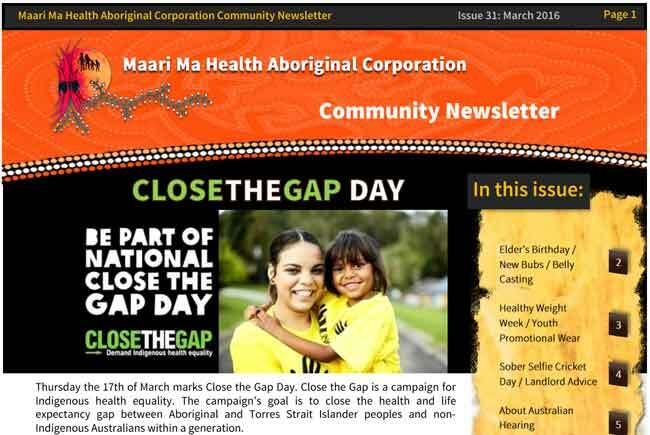 For the month of March our newsletter features articles on Close The Gap Day, Easter Closure dates, Australia’s Healthy Weight Week, White Ribbon, NAIDOC Week 2017, Well Done Bianca!, 2017 Far West Aboriginal and Torres Strait Islander Open Art Prize, Maari Ma Staff Update, Aboriginal Women’s Yarning Circle, Adult Dental Clinics at Maari Ma and more! 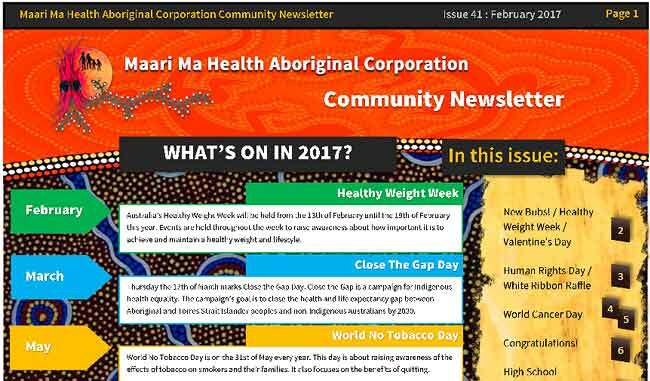 Our 2017 Community Newsletter for February features events and important dates for the year, New Bubs, Healthy Weight Week, Valentine’s Day, Human Rights Day, White Ribbon Raffle, World Cancer Day, a message of congratulations for Maari Ma’s Primary Health Worker trainees for completing their traineeships, High School Scholarships information, Playgroup and Cooking Group for Parents, Maari Ma Staff Update, 2017 Legal Aid Civil Law Clinics and more! Merry Christmas from all of us! For December we have all the news on White Ribbon Day, Maari Ma Staff Update, Appliance Replacement Offer, Tobacco Tips for the holiday season, Tackling Indigenous Smoking TV ads, HIPPY Graduation, HIPPY and Playgroup Christmas Party, Christmas closure times, Where to find Santa in town, Cricket at Clontarf, and a recipe to make delicious seasonal Reindeer Cupcakes! 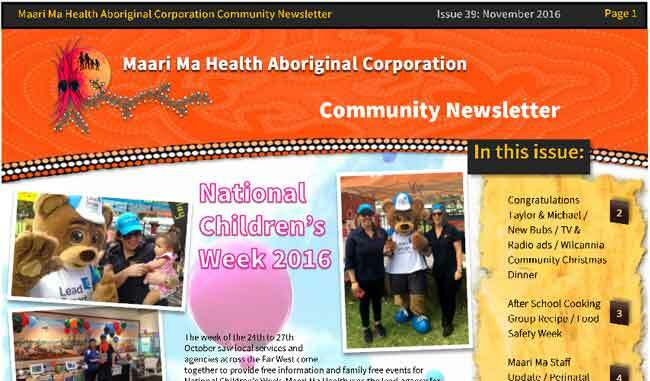 For the month of November our community newsletter features stories on National Children's Week 2016, our congratulations to Taylor & Michael on their wedding, New Bubs, TV & Radio ads, Wilcannia Community Christmas Dinner, After School Cooking Group Recipe, Food Safety Week, Maari Ma Staff Update, Perinatal Depression & Anxiety Awareness Week, Indigenous Scholarships, White Ribbon Day, World COPD Day, Leadsmart Launch, Renal Medicine and more. 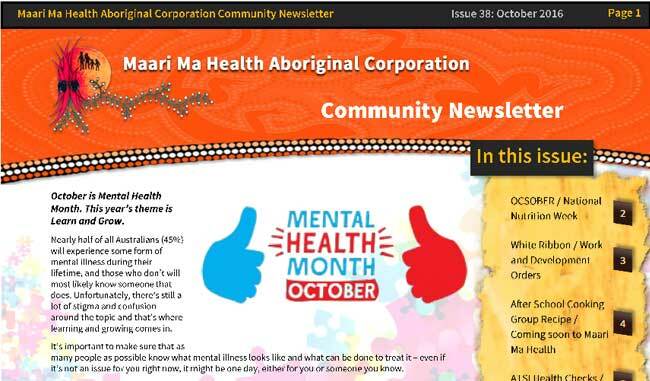 Our October 2016 newsletter features stories on October Mental health Month, "OCSOBER", National Nutrition Week, White Ribbon, Work and Development Orders, After School Cooking Group Recipe, iPads coming soon to Maari Ma Health, ATSI Health Checks, National Children’s Week 2016, PINKTOBER, World COPD Day 2016 and more. For September our newsletter has all the news on Father's Day, including the Father's Day Raffle winners, Elders’ Birthdays, New Bubs, International Peace Day, After School Cooking Group, Active Kids, Maari Ma Dental Team, Is Your Child Ready for Big School? 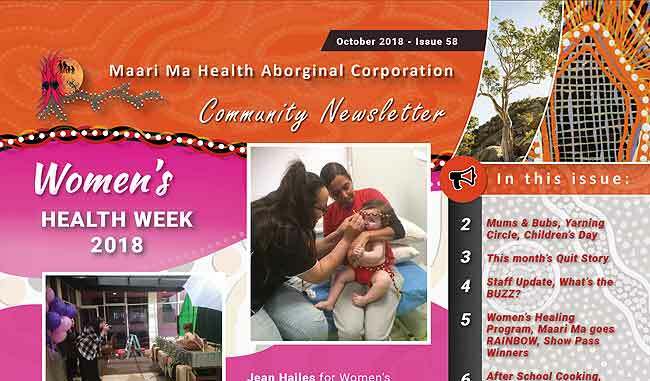 Photo Competition, Staff Update, Women’s Health Day, Respiratory Clinic, NSW Children’s Week, R U OK?, World Suicide Prevention Day, Save The Date — Mental Health Month, Maari Ma’s Tackling Indigenous Smoking (TIS) Team visits Alesco and more. 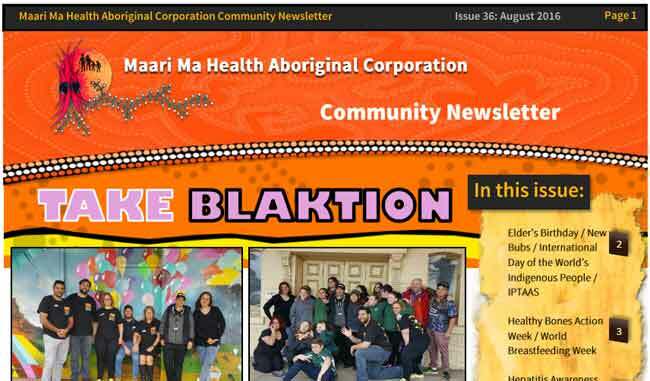 Our August 2016 newsletter features news on TAKE BLAKTION, an Elder’s Birthday, New Bubs, International Day of the World’s Indigenous People, IPTAAS, Healthy Bones Action Week, World Breastfeeding Week, Hepatitis Awareness Week, Local Council Elections, a Maari Ma Staff Update, Aboriginal Women’s Group, Alex’s Education Session, White Ribbon Morning Tea, Smoking and Breastfeeding, National Dental Week 2016 and more. 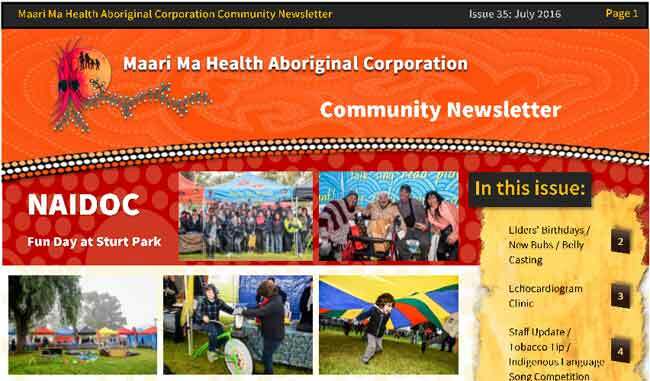 For the month of July our newsletter has stories on the NAIDOC fun day at Sturt Park, Elder's Birthdays, New Bubs, the Echocardiogram Clinic, Staff Update, an Indigenous Language Song Competition, The Tobacco Control Project, and our After School Cooking Group has a great recipe for some tasty beef & veggie sausage rolls! 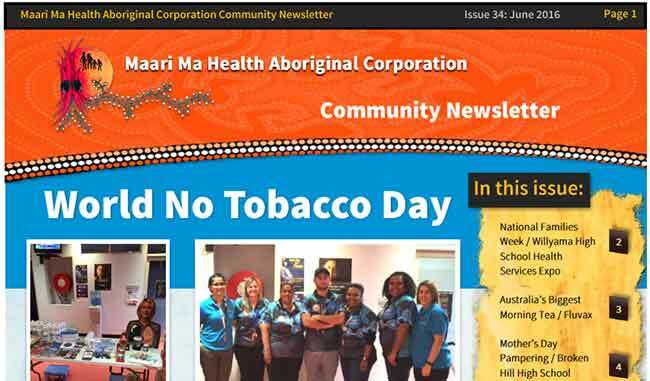 Our June 2016 newsletter features stories on World No Tobacco Day, National Families Week, our recent Health Services Expos at Willyama High School and Broken Hill High School, Mother's Day Pampering, Youth Workshop Community Invitations, Real NSW Photo Competition, Fluvax information, Australia's Biggest Morning Tea, Maari Ma Staff Updates, and details of our new program: Tackling Indigenous Smoking. 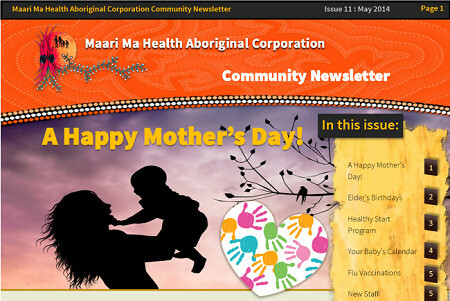 For May our newsletter features articles for Mother's Day, our Mother's Day Raffle, Elder's Birthday, New Bubs, Mums Group, National Families Week, World No Tobacco Day, Australia's Biggest Morning Tea, Legal Aid Civil Law Clinics, Menindee Health Service Celebration, Youth Workshop & Community Invitation (PLEASE NOTE - This event has been CANCELLED), Victims of Crime Support Services, Maari Ma Staff Update and Maari Ma's brand new Lead Program. 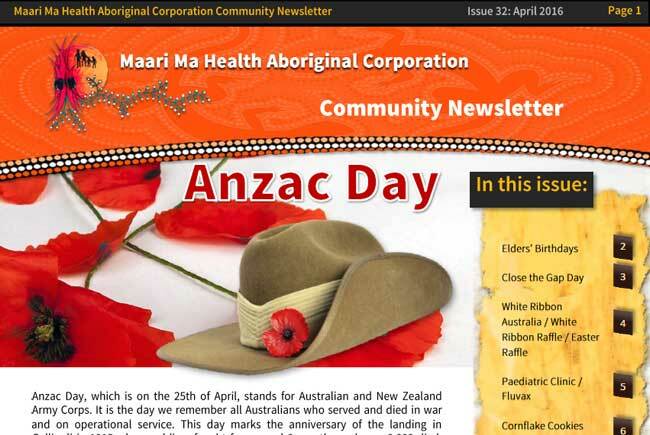 Our newsletter for April features stories for ANZAC Day, Elders' Birthdays, Close the Gap Day 2016, White Ribbon Australia - including the winners of our White Ribbon and Easter raffles, our Paediatric Clinic, details about Fluvax, a delicious cornflake cookies recipe, details on the Living Desert Dash Fun Run, Maari Ma staff update and more. 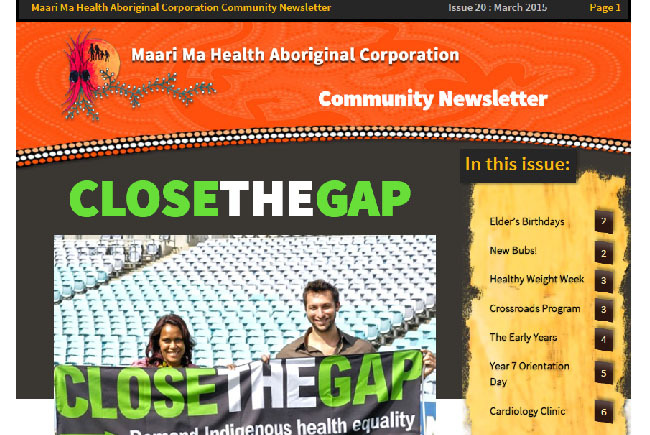 For March our newsletter features Close The Gap Day, An Elder’s Birthday, New Bubs, Belly Casting, Healthy Weight Week, Youth Promotional Wear, Sober Selfie Cricket Day, Landlord Advice, About Australian Hearing, 2016 Aboriginal & Torres Strait Islander Art Prize, Indigenous Community Links, Maari Ma Staff Update and more. 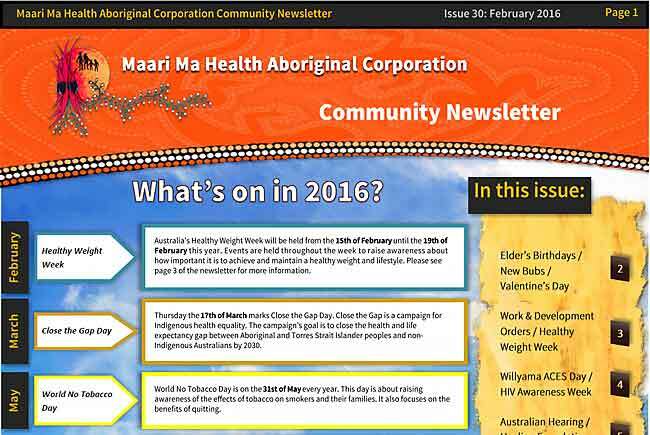 Our first newsletter of 2016 features event information, New Bubs, Elder's Birthdays, Valentine's Day information, Work & Development Orders, Healthy Weight Week, Willyama ACES Day, HIV Awareness Week, Australian Hearing, Healing Foundation Apology, Early Years, Maari Ma Staff Update and more. Merry Christmas from all of us! 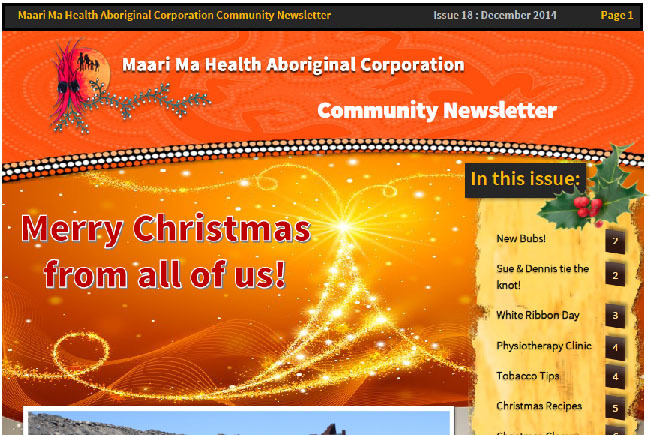 For December our newsletter has the latest stories on the Far West NSW Business Awards, Elder's Birthdays, New Bubs, Maari Ma Staff updates, White Ribbon Day, Postnatal Depression Awareness Week, HIPPY Graduation, Tobacco Tips, Tasty Christmas Recipes, details about our Christmas Closure, the Christmas Pageant and to let you all know that Santa is in town! 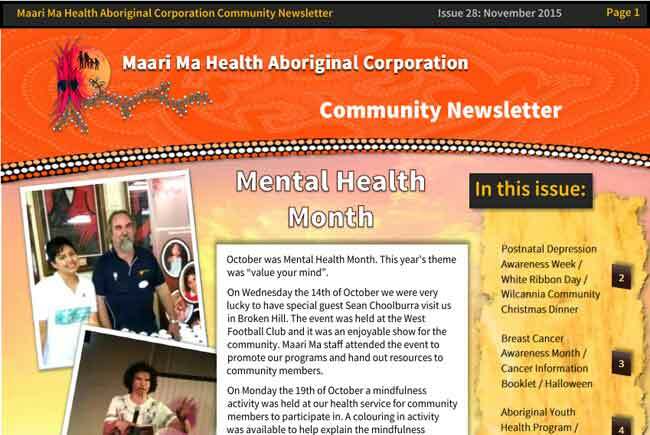 Our November newsletter features stories on Mental Health Month, Diabetes Australia Walk to Work Day, Postnatal Depression Awareness Week, White Ribbon Day, Wilcannia Community Christmas Dinner, Breast Cancer Awareness Month, Halloween, Aboriginal Youth Health Program, Food Safety Week, Highway to Health and a Maari Ma Staff Update. 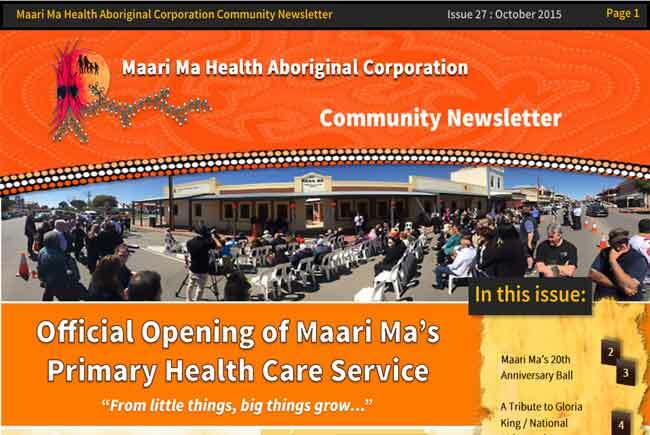 For October our newsletter has all the latest stories on the Maari Ma Primary Health Care Service grand opening, Maari Ma's 20th Anniversary Ball, a tribute to Gloria King, articles on National Ride2Work Day, Mental Health Month, R U OK? Day, NSW Children's Week, National Nutrition Week, Australian Hearing, ATSI Health Checks, and Sir Madam Salon's visit to Broken Hill. 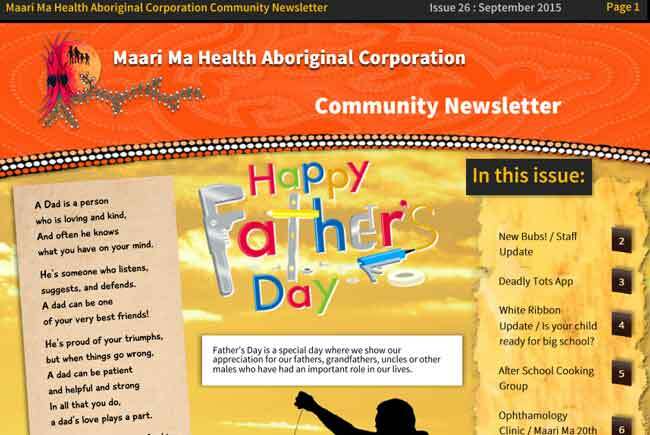 Our September newsletter features articles for Father's Day, National Stroke Week, New Bubs, Deadly Tots App, White Ribbon Update, Is your child ready for school, After School Cooking Group, Ophthalmology Clinic, Maari ma staff updates and more. 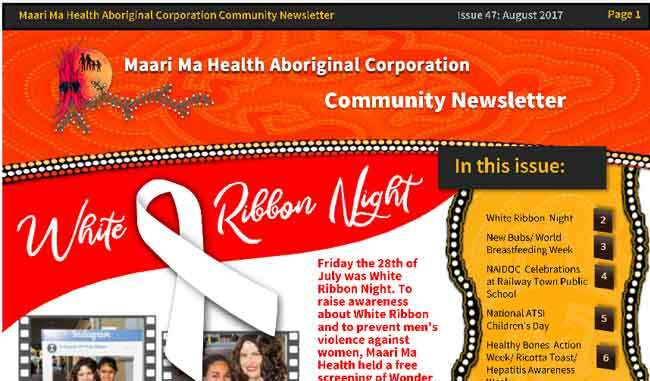 For August our newsletter features articles on White Ribbon Night, the NAIDOC celebrations, Lead Ted, celebrating 20 years of Maari Ma Health, National Dental Week, World Breastfeeding Week, After School Cooking Group, Maari ma staff updates and more. 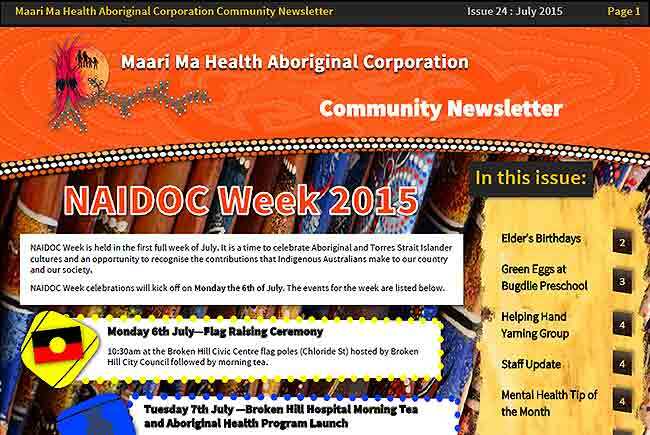 Our July newsletter features all the event details for the NAIDOC celebrations, plus information on Elder’s Birthdays, Green Eggs at Bugdlie Preschool, Helping Hand Yarning Group, New Smoking Laws, Optometry Clinic, Fluvax, Early Years and more. 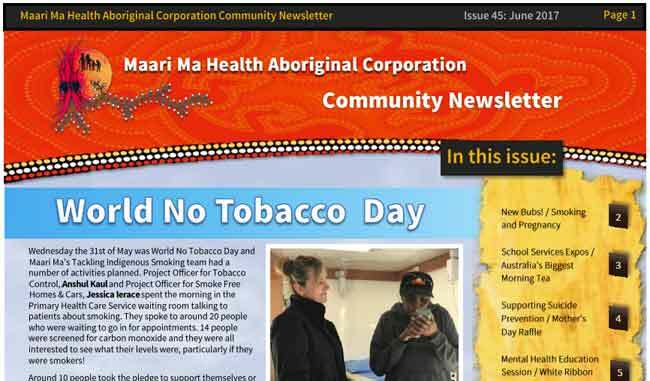 This month our newsletter features details about World No Tobacco Day, New Bubs, Home Visits, Healthy Eating, poetry by Dorothy Law Nolte, Patient Feedback, The Helping Hand Yarning Group and more. 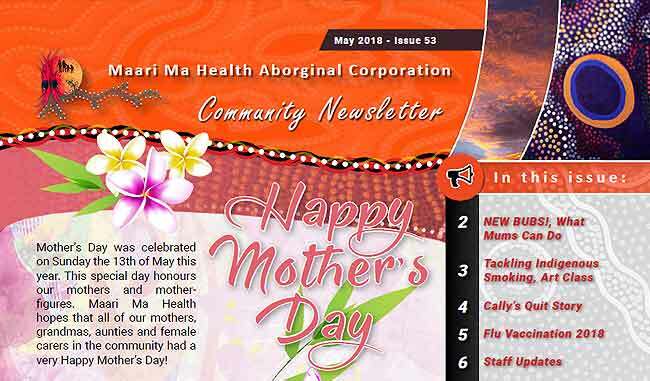 Our May newsletter features details about Mother's Day events and competitions, Elder's Birthdays, New Bubs, Belly Casting, World No Tobacco Day, the Women's Yarning Group, Healthy Start and ATSI Health Checks and more. 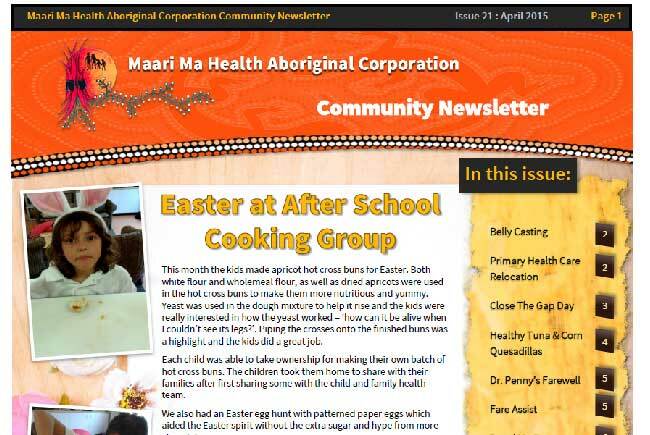 This month's April newsletter features Easter at the After School Cooking Group, details of the Primary Health Care relocation, Close The Gap Day 2015, Dr. Penny's Farewell, Renal Medicine, two delicious recipes and more. 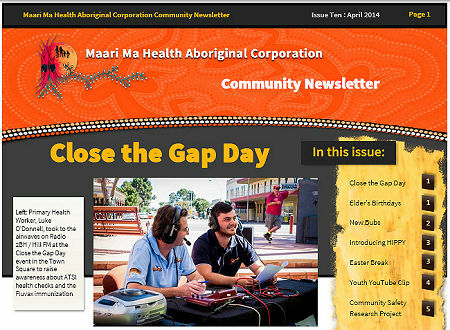 Our March newsletter reports on Close The Gap Day 2015, New Bubs, Healthy Weight Week, the Crossroads Program, Year 7 Orientation Day, the Cardiology Clinic and more. This month our February newsletter features details about our brand new Primary Health Care Service due to open in March, Elder's birthdays, New Bubs, Antenatal Classes, our Mobile Clinic, FEBFAST, The Early Years, Healthy Weight Week, Home Medicines Review and more. 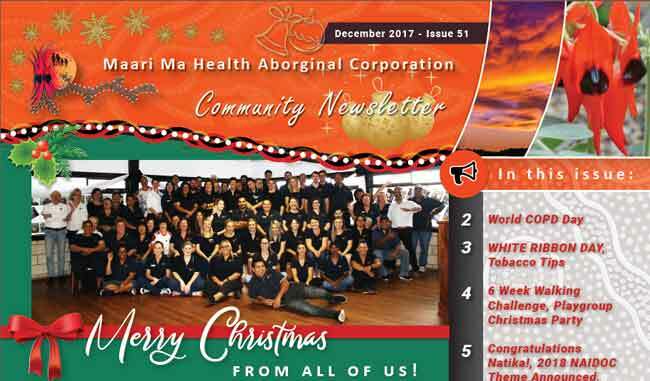 Our Christmas newsletter features details about New Bubs, Sue & Dennis' wedding day, White Ribbon Day, Physiotherapy Clinic, Tobacco Tips for the holidays, Yummy Christmas Recipes, Maari Ma closure times and dates, Staff updates, Tiffany Cattermole's inspiring hard work to become a registered nurse, and all the details about Santa coming to town! Maari Ma would like to wish all of you a very Merry Christmas and a safe and happy New Year! 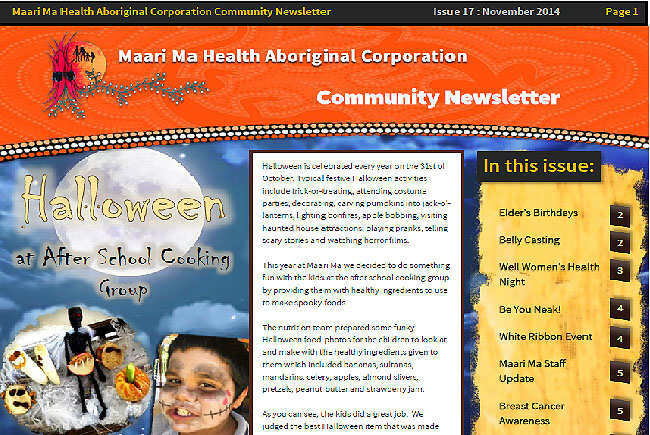 Our November newsletter features details about Halloween After School Cooking, Elder's Birthdays, Belly Casting, Well Women's Health Night, "Be YOU Neak", White Ribbon Event, Staff Updates, Breast Cancer Awareness, Optometry Clinic, Postnatal Depression Awareness Week and much more. 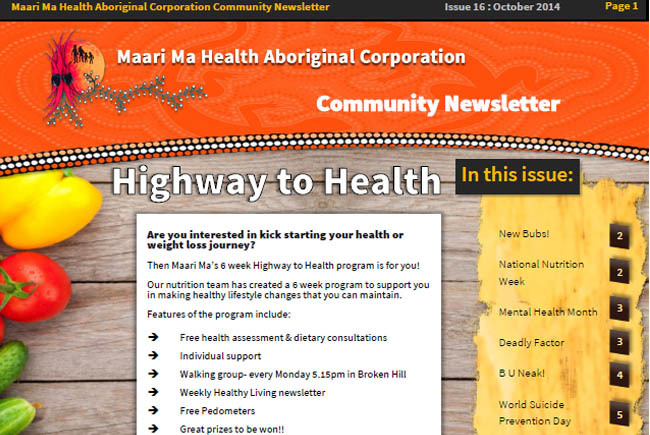 The October Maari Ma Community newsletter features articles on Highway to Health, quitting smoking, New Bubs, and event information for National Nutrition Week, Mental Health Month, Deadly Factor, be YOUnique, National Children's Week and more - with past events such as World Suicide Prevention Day and the Wilcannia & Menindee Fun Days. 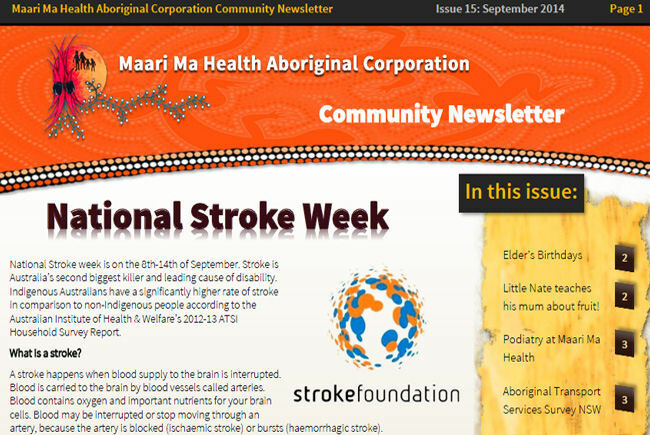 The newsletter for September features articles for National Stroke Week, Father's Day, how to get SMS appointment reminders, Elder's birthdays, learning about fruit, Maari Ma podiatry services, Aboriginal transport services, a healthy recipe for chicken strip wraps, GP clinics, information and advice on your child's first school year, and Maari Ma Staff updates. 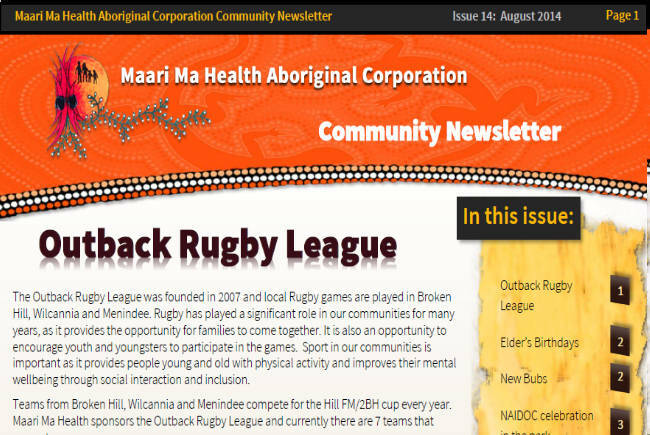 Our August newsletter features details about the Outback Rugby League, Elder's birthdays, New Bubs, the NAIDOC celebrations in Sturt Park, information about the role of the Keeping Well Team, this month's Aboriginal Women's Gathering and the latest Maari Ma Staff updates. 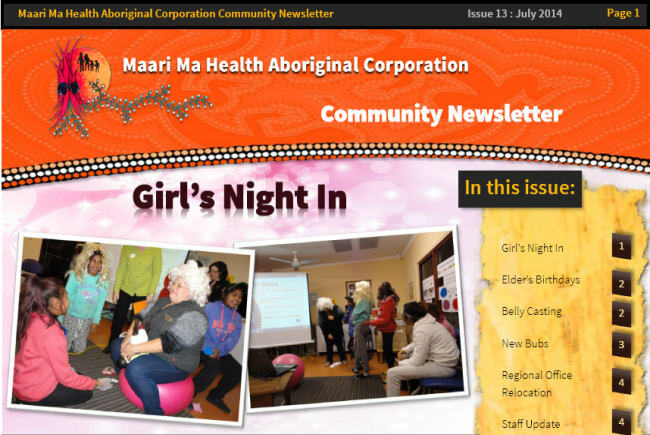 The July newsletter features our recent Girl's Night In event, Elder's birthdays, New Bubs, News on the recent move of the Maari Ma regional offce in Broken Hill, Staff updates, and all the latest events information for this year's NAIDOC week! 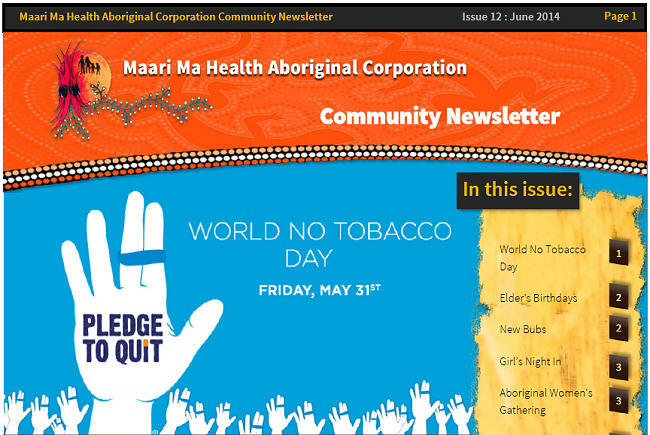 Our June newsletter features the World No Tobacco Day event, Elder's birthdays, New Bubs, Aboriginal Women's Gathering, Maari Ma Staff updates, photos from our Kid's Cooking Group, and a recipe to make your own delicious and healthy sushi rolls. 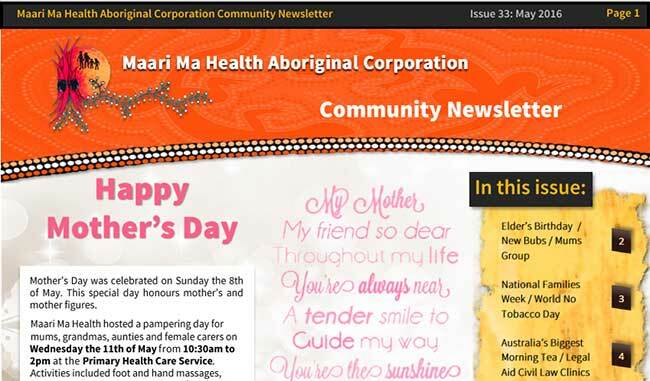 This month our newsletter features the Mother's Day event at Maari Ma’s Child and Family Building, Elder's birthdays, Healthy Start Program, important information about the Flu Vaccination, details about our new Wilcannia mobile clinic and a tasty healthy recipe for tuna patties. 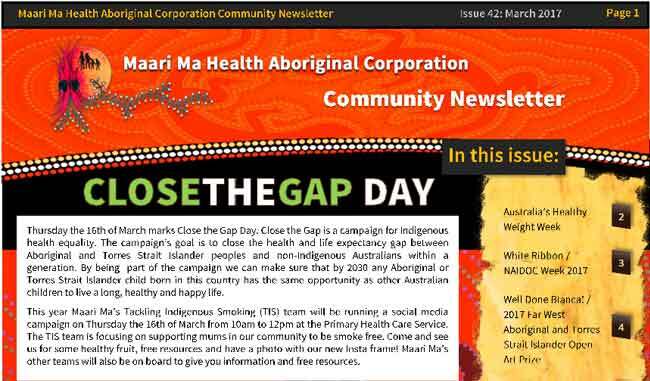 The new Maari Ma community newsletter features reports on Close The Gap Day, birthdays, new bubs, community events, programs and health information. Included is also a special healthy recipe for a great-looking and tasty Easter bunny veggie tray. 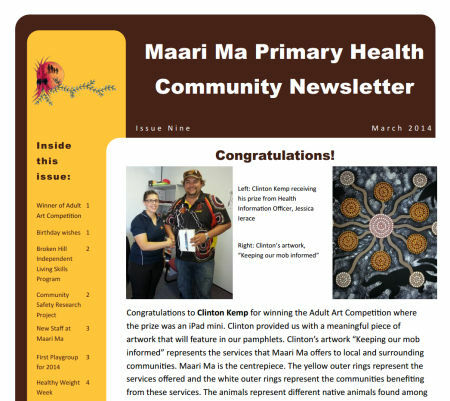 The March edition of our newsletter features the winner of our Adult Art competition, information on our Independent Living Skills Program, Healthy Weight Week, community events, and more.